A well-established community organisation, Connect Victoria Park of WA Inc. has been active for 60 years in Victoria Park. Until 2015 we were known as the Senior Citizens’ Welfare Association. 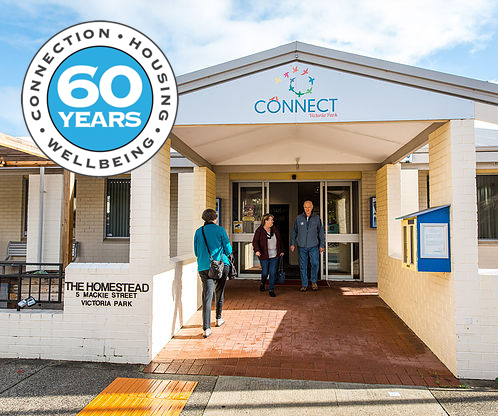 Connect Victoria Park’s twofold mission is to provide access to affordable housing for low income people over 60, and to create opportunities for older people to connect with each other and build a sense of community. In addition to units on Mackie and Cargill streets, we run a well-known community venue, The Homestead, on 5 Mackie Street. Here you can attend regular fitness and exercise classes, a creative writing group, meet others to go for a walk or a bike ride, have lunch with friends every Tuesday. We run special and one-off events to help people age successfully and create meaningful connections. We have recently commenced implementation of WA’s first Village Hub, building a community of people 55+ in Vic Park who help each other, share knowledge and skills and enjoy full and purposeful lives. At The Homestead, members of the Village Hub can access the Help Centre, find other members or volunteers to assist with small tasks, and help shape how this community evolves into the future. Learn more and become a member of the Village Hub.